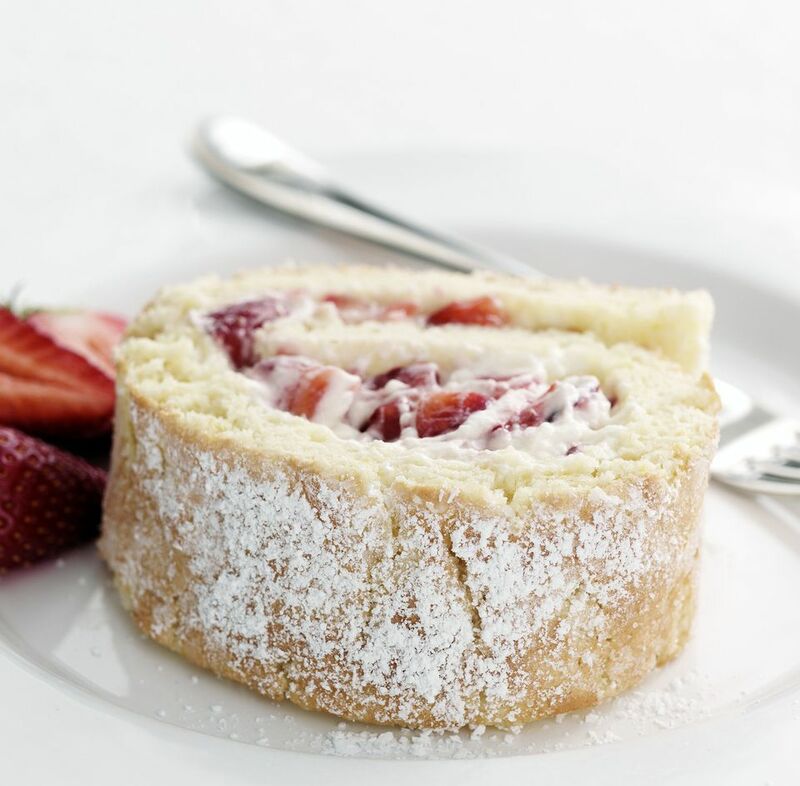 As the base for this raspberry-whipped cream roll, also known as a roulade or Swiss roll, we used a Hungarian sponge cake recipe. The decadent filling consists of canned raspberry filling, whipped cream, cream cheese, and fresh raspberries. It can be made with any whole berry—raspberries, small wild strawberries, blueberries, blackberries, boysenberries. Larger fruits that require cutting are not recommended because the juices they exude will make the filling soupy. To make the sponge cake: Heat oven to 375 F. Line a half-sheet pan with parchment paper. Then lightly coat the parchment with cooking spray. You can alternatively use a jellyroll pan, but if you do, the sponge will be thicker. Whip egg whites with salt and 1 tablespoon water until stiff but not dry. Add eggs yolks one at a time while whipping on low speed. It should take 2 minutes to slowly incorporate the yolks. Add the sugar by the spoonful again at slow speed, taking about 4 minutes to mix it all in. The batter should be light and fluffy at this point. Sprinkle 1 tablespoon flour over the batter and gently fold it in by hand, trying not to reduce the volume. Repeat with the 3 remaining tablespoons of flour. Pour batter into prepared pan, spreading it evenly. Bake 12 to 15 minutes. Do not overbake. Remove from oven. Place another sheet of parchment paper on a countertop and invert the cake it onto the parchment-lined countertop. Remove parchment paper that lined the pan and is now the top of the sponge. Roll the sponge in the fresh piece of parchment paper and let it cool completely. To make the filling: Meanwhile, whip the cream and refrigerate it. In a large bowl, beat the cream cheese, sugar and vanilla until light and fluffy. Fold in the whipped cream and refrigerate until ready to assemble. To assemble the cake: When the sponge cake is cool, unroll it and trim off any crusty edges. Spread the raspberry filling evenly to the edges. Top the raspberry filling with an even layer of whipped cream mixture spread to the edges. Place whole raspberries in straight horizontal lines on the entire surface of the cake. ﻿Using the parchment paper as an aid, lift the sponge from the bottom of one short side if you like a thick roll or from the long side for a narrow roll, and roll up into a tight cylinder. Some of the filling is bound to squish out the sides. Refrigerate several hours to firm up. When ready to serve, transfer to a pretty platter, dust with confectioners' sugar and cut into 1/2-inch slices. Serve with a dollop of whipped cream and a few berries, if desired.